Base... 3/4 in. x 13 1/2 in. x 26 in. 1/4 in. Baltic birch ply 11 in. x 26 in. Stop... 3/4 in. x 6 in. x 13 1/2 in. Don''t bother to wax or finish the surface of the Baltic birch ply, as having a bit of ready grip to it will come out to your advantage. 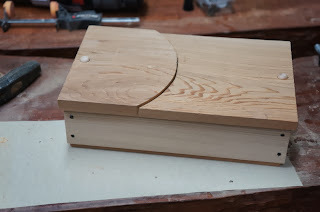 I used a vacuum press to glue the Baltic birch to the heavier plywood, but you can also simply apply glue to thinner stock, line it up on three edges to the base and put weights on to hold it in place as the glue sets. Be careful that the top layer doesn't shift position as the pressure is applied. 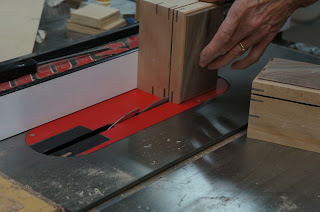 When the glue has dried, use a framing square as you screw the stop in place, so that it will be perfectly square to the edge of the Baltic birch. You can apply wax to the surface where the plane slides. 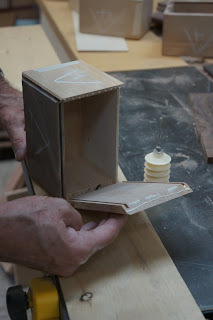 The box shown above was made today using hand tools and the shooting board. Years ago when I was just starting out as a professional woodworker, I read James Krenov's book, A Cabinet Maker's Note Book. 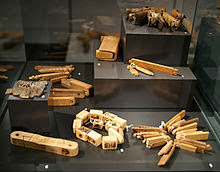 In it Krenov explained that the best work was done without nails or even screws... that dovetails, and various forms of mortise and tenon joints were superior and were the mark of a craftsman. To cut those joints requires skill and precision. They require exacting attention, an understanding of the materials, and practice of hand, body and eye in the use of tools. Not all work is done or has ever been done at the highest level of craftsmanship. Not every child will aspire to craftsmanship, and yet every child should have the experience of being a maker. Every child and every adult should have the experience of holding something they themselves have made through the use of their own hands. To become a maker is to see oneself in a new and different light. Having made something for the first time means that you are no longer simply a consumer of things made by others, but are instead a creator, aligned with the creative forces of the universe. And that in itself, may open the doors through which a child can find reason to aspire toward making finer things. 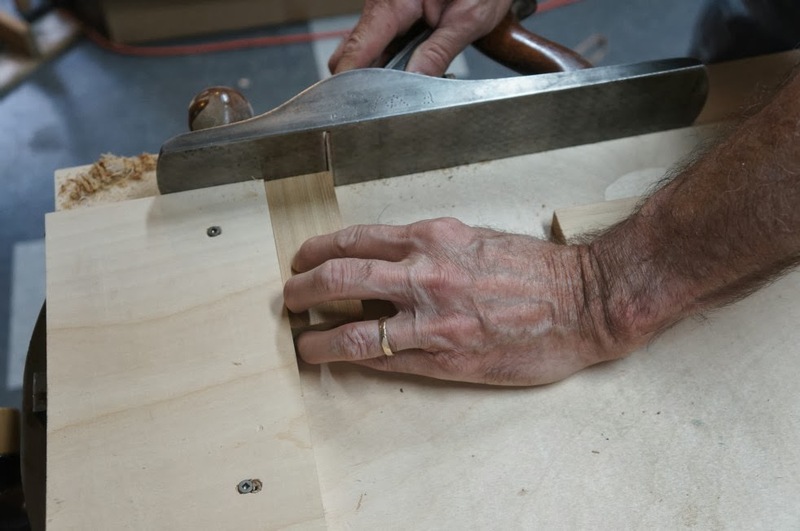 There is one little secret to nails that many of the finest carpenters will not know but that can keep you or your students from splitting wood. To make use of this secret requires close observation of each nail as it is positioned to drive into the wood. This secret is an unintended consequence of the way in which they are made, but can be used to your advantage. When nails are made, wire is pressed between two dies that form its head and point. The process leaves a small mark across the top of the head, and two sharp edges at the point on opposite sides and parallel to the mark on the head. These sharp edges when properly aligned cut into the grain, allow the nail to pierce the wood without splitting if the sharp edges are positioned at a 90 degree angle to the direction of the grain. If the nail is positioned so that these edges parallel the grain, the point of the nail works as a wedge splitting the wood. On very small nails like those used by kids in woodworking projects, the line at the top, and the tiny edges require close scrutiny. The edges are also sharp enough that you can determine proper orientation by feel. 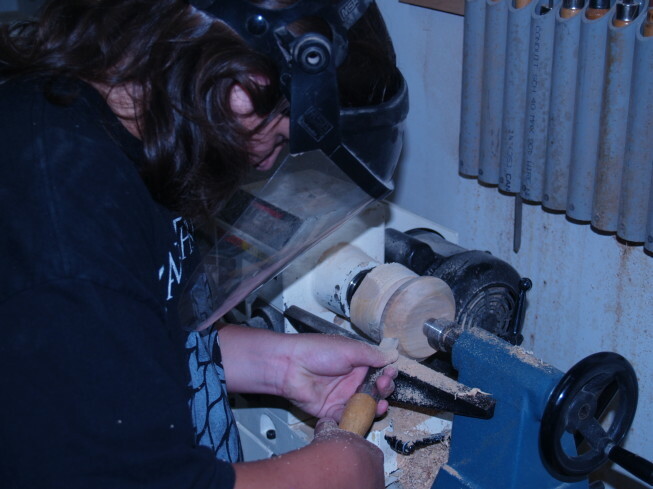 But learning the value of close observation is one more thing that students can learn in wood shop. This can be presented as a lesson on the value of close observation. And students can test the theory themselves to see if the lesson is true. 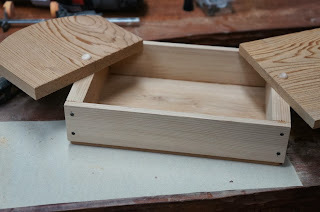 Today I am making a box with hand tools, and using nails to make things easier. Even adults need a simple starting point. A reader asked whether my knol on making a spoon carving knife is still available even though Google Knols were discontinued. You can find the article published by Make Magazine here. I'd also like to remind readers of my upcoming show at the University of Tulsa, Zarrow Center from October 4 through October 26. 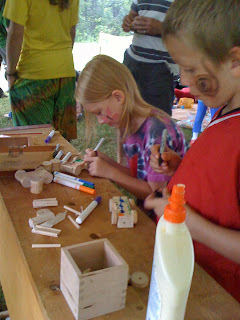 Yesterday I took work benches, tools and toy car parts to our Clear Spring School family music festival, Eureka Palooza. It was a rainy afternoon. Being in a large tent was a big help and brought a captive audience. I was assisted by Dylan, a Clear Spring School graduate. I had not known how busy I would be, and Dylan arrived at just the right time to help. Later, as the children's tent activities were winding down, I started to pack up, but found that more kids had arrived. Does anyone in education these days understand what it feels like to make something real in your own hands? If so, American education would be remarkably different. Most of the kids making cars were not my Clear Spring School kids. Instead, I had the opportunity to get a fresh set of kids interested in making things. 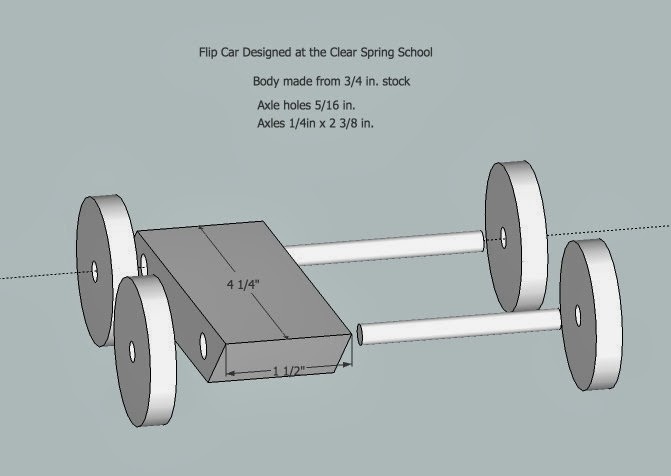 Our project yesterday was making flip cars. These are particularly fun because in addition to rolling you can press on the end and make it flip. There is no definite top or bottom and each side can be decorated. And so the questions arise: How exactly will the Public Service Commission use what it has learned? Will it simply use the public hearing to claim it fulfilled a portion of Arkansas law? The only possible way for the Public Service Commission to come out of this undamaged and without the appearance of having used the concerned citizens of Eureka Springs as exhibits in a regulatory dog and pony show will be for them to rule against the utility company. Our attorney is working on briefs that must be submitted on Tuesday. I am looking forward to resolution of this case, allowing me to devote all my time to teaching and woodworking. 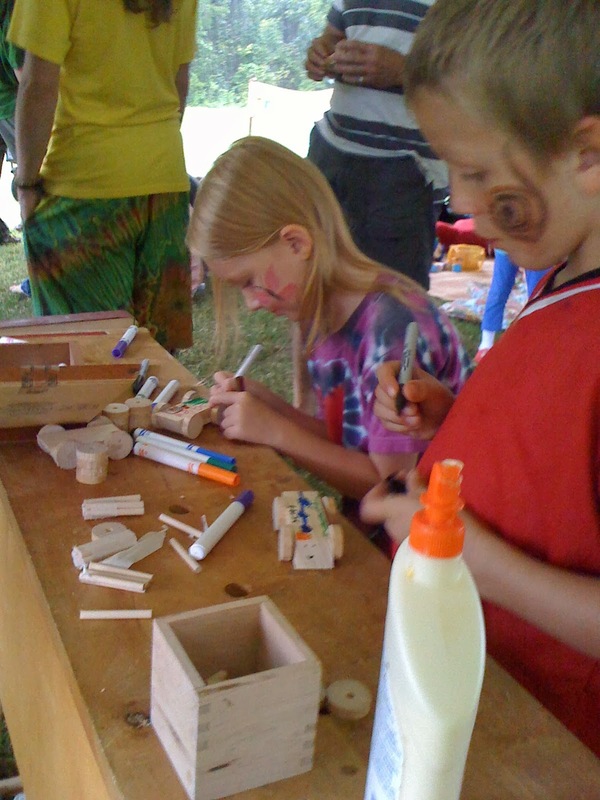 Today I'll take workbenches to Eureka Palooza, our Clear Spring School family music festival, and will spend some time woodworking with kids. This is a new box design, based on the small boxes I make with kids. It can be made exclusively with hand tools if you like. The two part pivot lid opens the box wide. I use axles intended to mount wheels on toy cars, as they have small heads that keep the lids from coming loose once the doweled ends have been glued in place. When I was presenting a class at the Missouri TEAM conference for technology education teachers this summer, teachers asked if I have my box designs for kids published in any of my books. This simple design will be in the new book, along with variations done with hand tools and machine tools in a variety of woods and designs. 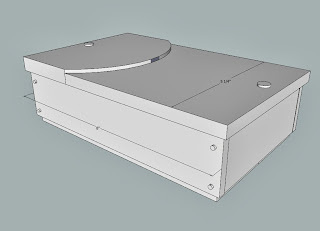 One thing I like about this design is the way one part of the lid locks the other in place. 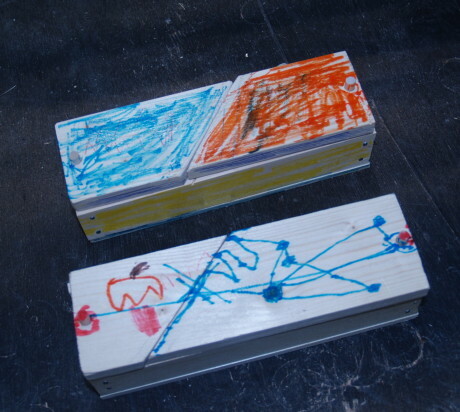 The design of this box was initially inspired by the difficulty children have installing hinges. 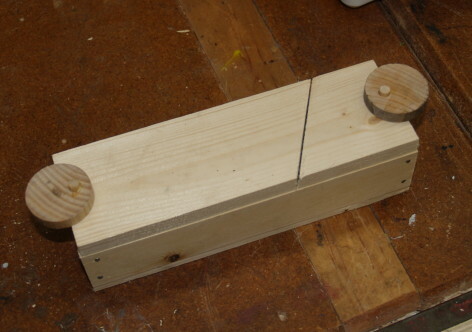 I have tried a number of hinge techniques, ranging from leather to nails, and this simple pivot hinge seems to be the easiest for children to make with the least amount of teacher intervention. I hope my grown up students like it. This article is from the New York Times: Chinese Educators look to American Classrooms. In China they know their students need hands-on learning that they just can't get from books. And American educators are just dumb enough to have gotten rid of wood shop. 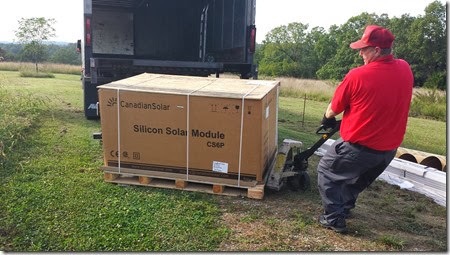 Members of my community are going solar, inspired in part by the outrage we all feel over AEP/SWEPCO's massive EHV 345 kV transmission project they have foisted upon our community. I am still reviewing testimony and helping our attorney and legal team to file briefs. A member of our UU church is getting solar power installed as a DIY project and it is written about in his blog. It provides a meaningful overview and describes the steps required. The prospect of major transmission lines running through our land has finally raised the cost benefit analysis to A Bigger Context (remember your ABCs!). When we consider the environmental and social costs of conventional power generation and distribution, it becomes clear we cannot continue to support them with our dollars. 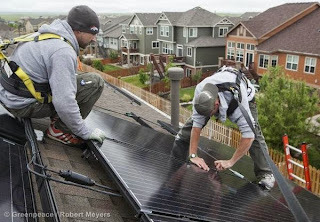 We are switching our vote to solar and the entire movement toward more people and earth friendly technologies. Our goal is net zero: to generate as much electricity as we use." I can see why the power companies are lining up against solar and demanding foolish projects like the one they are trying to force on us. They're dumb. And in the meantime, Corporate America is abandoning the grid. If we do the same thing, the huge coal dependent power companies will become dinosaurs. "So what will happen to the dinosaur utilities? Look at this wonderful statement from a top executive at American Electric Power: “Am I going to just sit here and take it and ultimately be a caretaker of a museum?” Deciding against that path, he further suggested that perhaps the big power companies ought to give in and make themselves useful by helping companies install their own electricity-generating equipment." Another article tells that Citi Corp has endorsed solar energy, not for environmental reasons, but for economic common sense. In reading the AEP/SWEPCO application to desecrate our community, we all become convinced of their utter stupidity. Seems like the nation's most powerful bankers are lining up in agreement. New Report from Citigroup: Solar energy is here to stay. 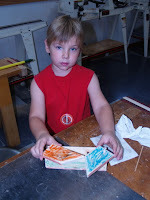 Today in the wood shop, my lower elementary school students finished their musical instruments, finished their boxes and began making toy vehicles. The middle school students worked on drop spindles, knitting spools, spool knitting, and boxes. 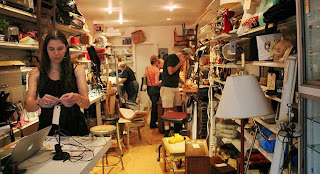 Make, fix and create.... choose the path that leads to the greatest possible direct, personal engagement in real life. I was weary from my travels today, but classes went well. The kids come ready to work, and picked up right where they left off last week. Kaitlin and Chloe finished their boxes. My high school students began personalizing their cahones with various shaped sound holes and wood burned ornamentation. Today an arts and antiques transfer service came to pick up my work for a show at the University of Tulsa, October 4 through 26, 2013. My supplies for the last chapter of my new book arrived, so some time in the next week or so, I will have the last projects underway. I'm headed home to day from Phoenix. Randall sent in this link about a renewed interest in repair. It's about time Manhattan was reclaimed by those more sensitive to the future of the planet, and this may be a sign. I had a discussion with family yesterday and was reminded that my sisters are all the ones in their families that know how to fix toilets, operate a skill saw, cut, fix repair and all those things. My sisters claimed that it had something to do with my father owning a hardware store, where they'd become quite used to the fact that folks would come in on their own to buy whatever they needed to make repairs. I think it also had to do with my mother's engagement in the arts and my father's encouragement of her every effort. Most people really don't know what they're missing. We get a a sense satisfaction and accomplishment from having saved old things from making a journey to the dump and knowing them to have come back to life in our own hands. Mr. Bump and his family are an Arkansas living legend and Dallas Bump was named an Arkansas Living Treasure in 2013. He says, "If you try you're gonna learn something every day." Yesterday I mentioned talking sticks as being a way that people recorded events and stories before the days of text. You can learn more about these from wikipedia. Some folks would use split tallys to keep track of transactions between two parties, and the longer part of the stick would be given to the one owed the debt. I use story sticks all the time in my work as a way of recording and transcribing measurements. People who are used to written text may think this kind of thing primative. I find it useful. Human beings regardless of era, have used external devised to facilitate memory and to assist in the making of beautiful or useful things. 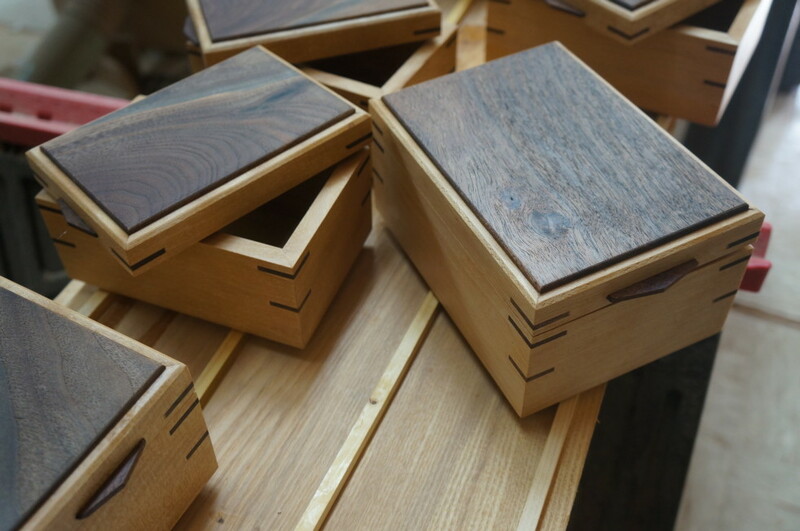 My box making classes and Fiske Lecture with the Northeast Woodworking Association have been announced. Enrollment is limited. Pima Indian calendar or "talking" stick. Lanny Nickel’s testimony in the Little Rock Arkansas Public Service Commission (APSC) hearing on August 29, told that Southwest Power Pool (SPP) wants a huge Extra High Voltage (EHV) 345kV system to surround Northwest Arkansas, and just as reported months ago by members of Save the Ozarks, the Shipes Road to Kings River power line is part of that with additional parts to come up for APSC approval later. According to Nickel, SPP wants a robust system for "reliability". The extra transmission capacity for them is just an unstated bonus that will give huge profits. They prefer not to talk about that. . In response to Save the Ozarks expert witness Dr. Hyde Merrill’s testimony, Nickel confirmed that the rationale proposed in the Notice to Construct issued by Southwest Power Pool is no longer a concern that would justify the project. But still SWEPCO and SPP have come up with additional reasons for the project, despite their old reason no longer holding water. Nickel and SPP attorney Kaplan showed those reasons on a big map, illustrated in airbrushed red colors (very professionally done and so convincing to the Judge that she asked to keep it). That map showed areas of concern along the route east toward Harrison on the Entergy side of the seam between suppliers. Melinda Montgomery of Entergy, testifying earlier for SWEPCO insisted that there were and are no reliability concerns or problems on the Entergy side of the seam, but in all fairness, she did acknowledge that having such a robust line in the neighborhood would provide extra reliability that was not really necessary. If the hearing in Little Rock was indeed an evidentiary proceeding, and not simply a dog and pony show for the kids, someone will have to examine the conflicting evidence offered by SWEPCO. If the Notice to Construct is the basis for the application and the reason is no longer valid, the application is false or in error and should be dismissed. If AEP/SWEPCO has new reasons, then let them apply again. When SWEPCO's own witnesses dispute part of the new grounds presented by AEP/SWEPCO and Southwest Power Pool, and much of the information necessary to even evaluate the truth of Nickel’s testimony is kept from Save the Ozarks by SWEPCO and SPP’s refusals to respond to data requests, all parties, including the commission are kept in the dark. As long as we are purposefully kept in the dark, we have every reason in the world to distrust whatever conclusion the judge and commission arrive at that is not full and complete dismissal of the application. Can folks see why all of us have been kept off balance by the process through which AEP/SWEPCO is attempting to claim eminent domain and destroy our properties, and damage the environment upon which the success of our tourist economy depends? AEP/SWEPCO and the Southwest Power Pool came at us with very big plans to build a huge transmission system hauling wholesale power throughout Northwest Arkansas, and beyond, claiming it was for our own reliability....our own good. They do this by putting forward one small step at a time, hoping we don't notice the full ugly effect, a process the US Army Corp of Engineers calls "piecemealing". If we don't stop the Ships Road to Kings River power line proposal, there will be more and more of these ugly projects all across North Arkansas and up through Missouri. Distributed power generation promises to save us from the ugly grid. Go Solar and Save the Ozarks. In the absence of a formal written language, the O´odham of southern Arizona relied on oral tradition for memorializing significant events. The Oos:hikbina—translated from O´odham as “stick cuts upon”—was one way the Akimel O´odham (River People) annotated oral history. The other manner of revitalizing human memory is through songs. 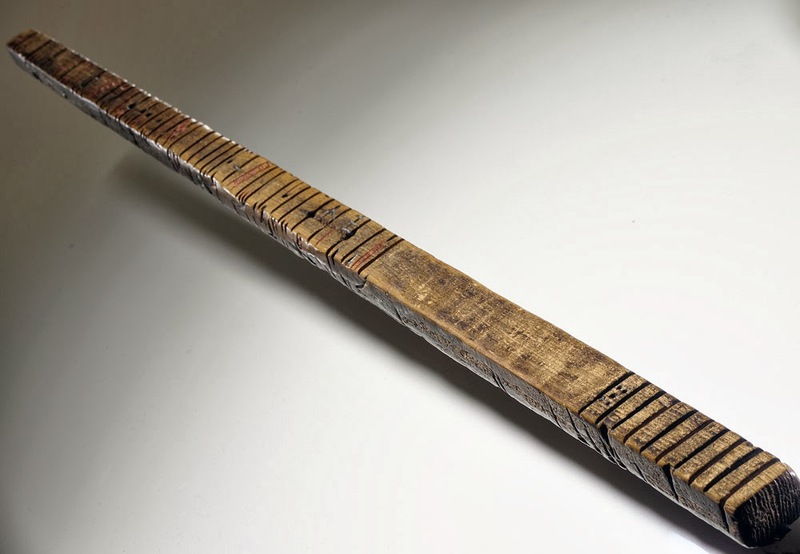 Most often, an Oos:hikbina was made by trimming a dry saguaro cactus rib flat on one or two sides to enable the recorder and keeper of the Oos:hikbina to etch dots, small notches, V-shaped cuts, and deep straight lines across the stick representing years. The symbols were often painted with natural pigments of blue soot and red clay. This Oos:hikbina, kept by Mr. Joseph Head and acquired by the collector Edward H. Davis in 1921, records events beginning in 1833. The Gila River Indian Community, the keeper’s homeland, was established by executive order in 1859. Several battles in which the Akimel O´odham and Piipaash (Maricopa) joined forces against enemy tribes are recorded. Natural phenomena and European influence—including the coming of the railroads in 1878 and 1886—are revealed with etched symbolism. The Oos:hikbina does not record every event that affected the lives of the Akimel O´odham and Piipaash, but it does provide insight into the inevitable progression of new beginnings. One of the ways we can choose to align our thoughts and our sense of self with higher purposes is through creative actions that offer useful beauty. An old saying is that idle hands are the devil's workshop, and if that is so, there was no devilry in my sister Ann. Those who knew her will remember that her hands were constantly busy, creating beautiful things to wear or to share with others. Smocking and sewing were her favorite things. Ann and I were born 18 months apart, and as very young children we would sit on the floor with our crayons. Ann would color both on her paper and mine. A single piece of paper was never enough to contain her creativity. Throughout all of Ann’s early years, she was busy with art projects. She even painted with Elmer’s glue. Ann's first job was at Brandeis Department store where as a high school senior, she designed window displays. She had refused to learn to drive because our Dad yelled at her when they went out for her first driving lesson. After having a teenaged daughter of my own, I can see how that could happen. So it became my regular job to pick Ann up after work each day, and if you knew Ann, you would know that when she became engaged in a creative project it was hard to tear herself away. I remember waiting, and waiting for her to get off work in downtown Omaha. But we spent many hours in the car and now for those hours I have no regrets. In college she amazed her art instructors with her study of complements and split complements in her use of color in her paintings. That skill with color led her to excel as a designer. At Goldsmith's department store in Memphis she managed the decorative accessories department in one of their largest stores. It surprised me one day when I learned that she had decided to buy a car and learn to drive. Her tiny red Subaru was the first I had ever seen in my life, and in many things Ann was ahead of her times. As a young mother, Ann reinvented counter-change smocking and her husband joked that when she would travel by air, she was required to sit in the smocking section. Her smocking patterns and dress designs were chosen for publication by McCalls, and she became known for her teaching, her patterns and her books. Later, as an award winning kitchen designer for Home Depot and Lowes, she was responsible for many of the most beautiful kitchens in Phoenix and still her work touched many lives. Even in her last days, small samples of her smocking were there within reach though her disease had progressed so far that she was no longer able to create. She retained her sense of beauty, her love of laughter, her courage and her concern for the well being of others. There is a Zen story about a master who lay dying. His students gathered around him pleading, “Master, please don’t leave us.” He answered with a question, “Where do you think I’d go?” If one were to ask the question posed by the Zen master, “Where would Ann go?” I believe you would find her wherever a girl leans over to color on her brother’s paper, or where a young mother sews something beautiful for her son or daughter to wear, or wherever a human being expresses loving kindness and concern for another. In these places you would find Ann. Ann, we will look for you in these places and try not to miss you too much. 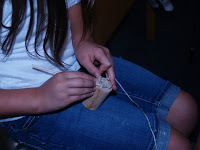 Today, some of my CSS students made knitting spools and learned to use them. Two of my 3rd grade students enjoyed it so much they planned to work on their spool knitting at lunch. My first grade students made twist top boxes. I mentioned the New York Times supplement on STEM education. "I'd like more hands-on projects where I would learn something about what I'm doing instead of just memorizing things from a textbook." That was one of the important roles served by woodworking, home economics and other forms of manual arts before educators threw all that kind of stuff out of schools during the late 20th century and the beginnings of this one. Now educators, still refusing to acknowledge the value of the manual arts, are inventing STEM, STEAM and all its acronyms in the pretense that they have discovered something new, and necessary. If any of these newfangled folks were to study the history of manual training in America they would discover that it was proposed by Runkle and Woodward as a means to prepare students for success in engineering. Anything sound familiar in that? 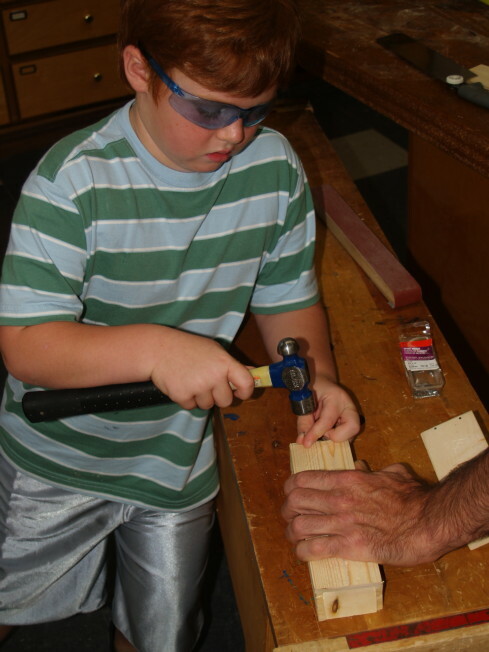 One educator commented, "We want kids to have that experience of seeing how science and math lead to making things." That sentence can be turned on its head in wood shop. Making things leads to confidence and competence in science and math. On Sunday, our organization, Save the Ozarks, held a fundraiser to support our effort to stop AEP/SWEPCO from putting a major high voltage power line through our community. the support was overwhelming and thanks to two 10,000 dollar anonymous matching grants, and all the hard work of a large number of volunteers, and thanks to the generosity of artists and businesses in Eureka Springs, we set a record of nearly 60,000 dollars raised. This equals the amount we had raised previously to support the hiring of witnesses and attorneys. I've been doing additional research and have learned that when Carroll Electric planned a new power line that is currently under construction from Viola, Missouri to Holiday Island, they were involved in negotiations with the US Army Corp of Engineers for 6 years over the location of a river crossing. AEP/SWEPCOasked the Corp of Engineer for a permit in September 2012, and was asked for clarification and additional information as their application was considered inadequate. They never contacted the Corp with the requested information, but assumed that they would have enough political clout to have their way... Once they got approval from the Arkansas Public Service Commission, they felt that the Corp of Engineers permit would become a fait accompli. Then along came a group of concerned citizens who have proceeded to blow AEP/SWEPCO out of the water. In the meantime, I'm sanding boxes, working to finalize work shop plans for November with the Northeast Woodworking Association and trying to compose my remarks for my sister's memorial on Saturday. For readers in New York State, I will be in the Albany area for box making classes and the Northeast Woodworking Association Fiske Lecture on November 14, 15, and 16. A special issue of the Science Times published int he New York Times, that came out on Sept. 3 is "Learning What Works" and is about STEM education and education reform in the US as it applies to teaching science and math. A friend had given a copy of this to my daughter since she is interested in science education, and when I saw it, I asked, "Oh, is this for me?" "No, its about STEM," she replied. I answered, "Didn't you know that STEM is what I teach, what I write about, and didn't you know that wood shop is about building a relationship with all those things that create an understanding through which science, technology, engineering and math are integrated into a student's understanding?" I guess not. Young folks are always discovering the world on their own, thinking it is new. I mentioned Sloyd to an educator the other day, and the response, was, oh, that's nice. And the first time I heard the word STEM, I was presenting an online seminar and was asked about it. Awkward, but they keep inventing acronyms for things faster than you can keep up. In any case, when folks, of whatever age are looking at the real world and attempting to put together an educational process based on how things really are, they tend to get things right, even if they are pumped up on the notion that they've discovered something new but that other folks have known all along. "If I could change one thing about engineering education--well, actually, all education--it would be to center it around solving real problems and making things. In other words, we ought to be creating innovators and inventors at our engineering schools. They need to be able to do something more than solve theoretical problems when they leave us. In other words, they should learn how to be an applied problem solver, which is not the same thing as being a fantastic book-based equation solver." I know what it is like to discover something new in the wood shop. One thing I've discovered is that much of what I discover is not actually new. 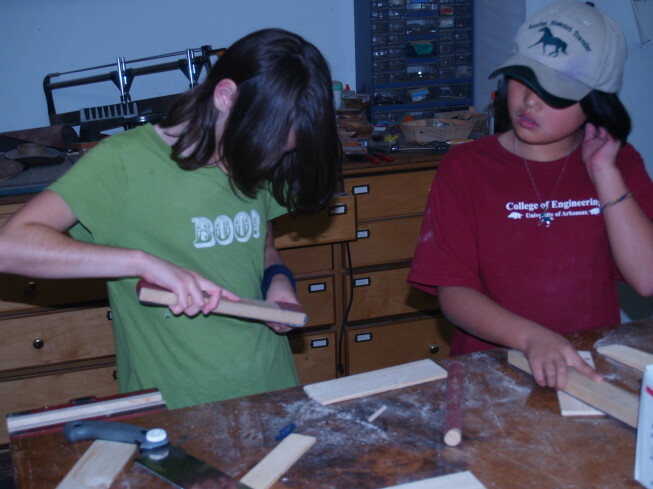 Those interested in STEM education, or just plain everyday education for each child would benefit an examination of the history of manual arts. I know the idea was that those were no longer of value. There are those who think they need to completely reinvent the wheel. It irks me that we have to contend with such. Today, my 4th, fifth and sixth grade students learned all kinds of things. Including how to make things from wood. 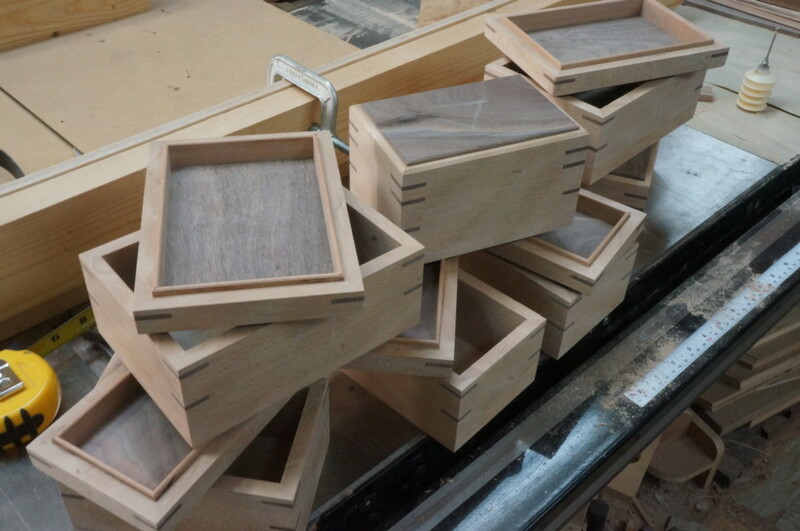 I finished the boxes with the exception of a final coat of Danish Oil. A few pieces of my work will be on exhibit in Tulsa during the month of October, so I am busy packing things for pick up. The show is called Connection, and is curated by a long time friend Lowell Baker. "This exhibition, curated by Lowell Baker, the University of Tulsa's Art Department Director, consists of art by four artists who are loosely connected in the artist world. Doug Stowe is a skilled woodworker, designer, author, and educator from Eureka Springs, Arkansas. Robyn Horn is a sculptor and painter from Little Rock, Arkansas. John Horn is a letterpress printer who has worked with Steve Miller, the coordinator of the Book Arts Program at The University of Alabama where he teaches traditional bookmaking and papermaking." My part of the exhibit will consist of small cabinets from my books Building Small Cabinets, and from Rustic Furniture Basics, as well as a variety of boxes, and sculptural forms. This article suggests that right and left handedness may have its origins in genetics. And as you can see, my boxes are nearing completion. The one shown is beech and walnut. Whether right or left handed, this box uses both as it has a lift tab on each end. Today I will finish the boxes I've been making for my sister's cremains. The photo at left shows the lid being cut from the base. 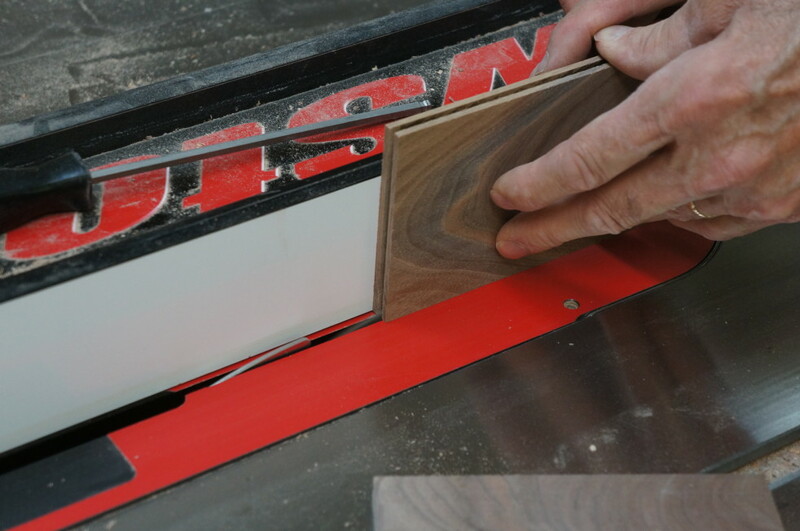 I set the blade height so that a thin sliver of wood is left to keep the lid from pushing into the blade. Still, I keep a steady, light pressure against the fence during the cut. I am also reading through transcripts from the hearing in Little Rock. It is amazing how misinformed many of the SWEPCO witnesses are. As you can see in the photo below, I've added keeper strips to the lift off lids, and all that remains to be done is to add lift tabs at the ends, sand and finish. Joe sent a link to this video in which Italian designer Enzo Mari discusses design. The essence of good design is not to be different, but because a thing can only be done this way. 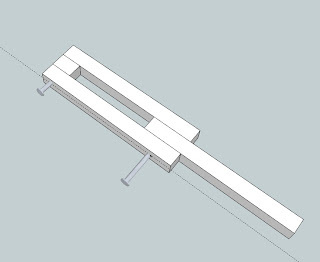 When you begin stripping away all the non-essential clutter of thought in the design of a thing it may begin to take a pure form. Those who are interested in the hands as I am will enjoys his use of his own hands to make that point. Enzo Mari for Artek: Homage to Autoprogettazione from Artek oy ab on Vimeo. My friend Beth Ireland, and the Eliot School in Boston have embarked on a new project with Boston Public Schools, Turning Around Boston. Support it through Beth's Kickstarter Campaign. Some may remember that 2 years ago Beth came to Eureka Springs for turning workshops at Clear Spring School and the Eureka Springs School of the Arts. After sanding and routing, assemble. Rubberbands and tape do the trick. 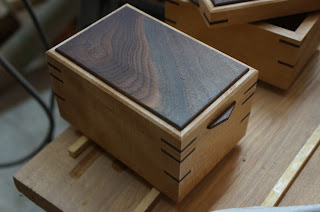 In my wood shop, I'm working on small boxes to hold my sister's ashes. One is to go to her husband, and the other two to her son and daughter. She had given me a list of woods that she considered important in recording her life's journey. Some were impossible to find in time for me to get the project done in advance of her memorial. Her list included Magnolia and dogwood for Memphis, and olive and mesquite for Arizona. I had just a bit of black mesquite in the shop, and my friend Larry Williams uses beech in the making of his planes. So, I settled on those two woods. At this point, I have the miters cut, and am working on top panels. 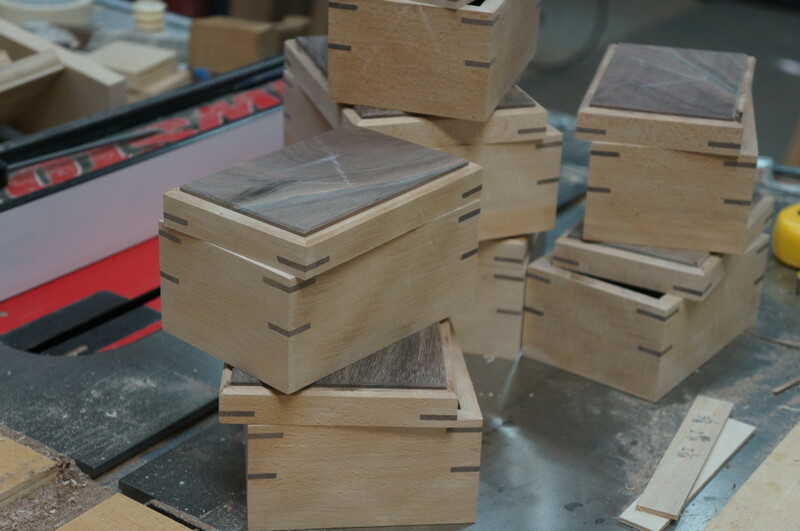 In addition to boxes made of beech and mesquite, I'm making 4 smaller ones at the same time using walnut for the lid panels. I don't intend that these be quickly done. But they will be simply because I make boxes all the time, and am practiced in the necessary skills. It feels great to be back in the wood shop after what seems to have been an unnecessary period of distraction. I look forward to SWEPCO's complete withdrawal of the profance application to build their ugliest of all power lines through my community. My sister Ann passed away yesterday, surrounded by loving family. She was the most artistic of us. At one point, her math teacher called my mother to a conference to and suggested "Don't expect very much from Ann when it comes to math." He sure didn't. But then there are things about math that teachers of math often don't fully understand. Art and math are not completely different things. They are slightly divergent ways of looking at the same thing. Despite her teacher's lack of confidence in Ann's ability to manipulate numbers, Ann had profound spatial sense (the true foundation of math), that she used in developing designs for counter-change smocking and as a kitchen designer. You can still find her counterchange smocking patterns and book available through her website, Ann Hallay Designs. The lesson that I learned taking Ann's sewing machine apart and not knowing how to put it back together, applies to American education. Math is not just the manipulation of numbers and art is not simply the decoration of objects or the making of things to fulfill some sense of extraneous, meaningless sense of beauty and form. Once you start taking things apart, it is hard to stop. And it is good to have a sense of things as a whole. Teachers and students alike, are often not taught to understand the complexity of interrelationships between science, art and math. This is what AEP/SWEPCO wants to do to us. I've been reading through testimony from the hearing on the Shipes Road to Kings River power line project foisted on our small and lovely local community by electric power giant AEP/SWEPCO. The photo shows exactly what they want to do to us, and the tiny figure in orange is a real person offering a sense of scale. I think you can see why so many of us are disgusted with AEP/SWEPCO. My reading at the moment is testimony from Melinda Montgomery who was to testify concerning an interconnection between her company Entergy, and the new power line proposed by SWEPCO. She insisted more than once that there were no reliability issues on the Entergy side of the seam that the new power line would fix. Entergy's cooperation in the project was to allow the new power line to interconnect and Montgomery insisted that its purpose would be to fix reliability issues on the SWEPCO side. Later in the hearing came Southwest Power Pool witness Lanny Nickell with a big map, colored in with red showing degrees of danger. It showed areas of extreme danger of overload in Berryville and Harrison, along power lines on the Entergy side of the seam. Our witness Hyde Merrill's analysis of the system had proven that the line was not needed to fix the problem that had been identified as the rationale in the Notice to Construct (NTC) and in the application before the APSC. SWEPCO and SPP witnesses have insisted that the power line is still necessary, but they have shifted the rationale down the line to Entergy's zone of control. In other words, the need proposed in the NTC and application is no longer valid, but they still want it and will go to great lengths to falsify testimony and exhibits. As the hearing had reached what we all thought would be its close, AEP/SWEPCO attorney Matthews made a motion that their newly falsified testimony and exhibit become the new basis for the application despite Melinda Montgomery's insistence that there were no reliability problems on the Entergy side of the seam. 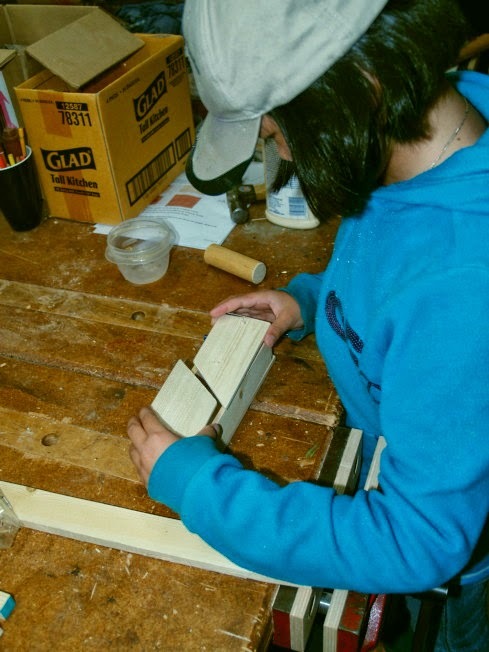 While there are differences between law and woodworking, some of the same lessons apply. You have to look closely at the details, but keep in mind the big picture. If you don't have that big picture in sight, you can make a fool of yourself with details, and miss that which is most obvious. Today I had my lower elementary school students in wood shop, and we began making pencil boxes for their desks. This is a new design based on a pivoting lid. 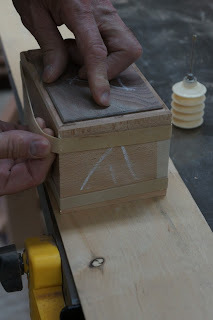 You assemble the sides, attach the bottom, then use dowels to attach the lid. Finally, the lid is cut into two parts, allowing them to pivot. I'm considering adding a slightly refined version of this simple box to my book. What do my readers think? When I took similar boxes for show and tell with shop and technology teachers this summer, they wanted to know if the boxes and their making was featured in any of my books. It seems that doing a box with hand tools, might be a good starting point for many woodworkers. And most certainly a thing they would want to share with their children and grandchildren. I am awaiting word of my sister's passing. She is in hospice care and down to her last hours or perhaps days. She has always been my big sister, even after I grew much taller in height. She was always the creative one, the artistic one. While I majored in Political Science, she majored in art. When we were little, she colored on my paper. There was no meanness in it. She knew that my paper needed her help. There were only 18 months between us and I've really not known the world without her being in it. On the other hand, at the age of 7, I took apart her sewing machine and it never worked again. That taught me valuable lessons that I've never forgotten. Pay attention to the details. Know the whole of a thing and understand how it works or how it is supposed to work before you commence in taking it apart. Each and every thing has meaning. Take care with the whole of it. It matters. I am reminded of a Zen story. The master was dying. His disciples were gathered around him, crying, "Master, master, please don't leave us." He looked up and asked, "Where do you think I'd go?" And the truth of us is that our individuality is well crafted participatory self-deception. We are intimately entwined in each other. There are no boundaries between us except those that our delusions have created. Skin? Our own thoughts? Are there any real boundaries that define us if we choose to live within a broader view of our humanity? 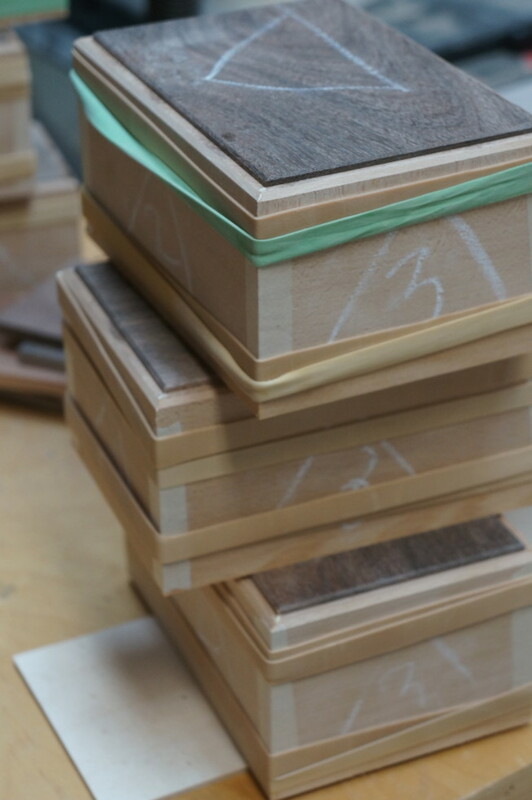 On another note, my box making class at Marc Adams School of Woodworking fills up fast. In fact last year we offered a second class because the first was full. Not much chance of that happening this year, so if you are interested in having a full week of creative box making, go to MarcAdams.com and look at the new schedule. Class enrollment is offered first to those who took classes this last year, and second to returning students. If you've not been there before, consider yourself in for a treat. And do not wait or you will miss the opportunity to register. In addition, I'll be offering a weekend class in making small cabinets. Chinquapins nuts still exist in the Arkansas forest. While the Chestnut blight killed almost all chestnut related species throughout the eastern US, and while there is a major effort to build a blight resistant chestnut by crossing remaining genetic stock with a Chinese Chestnut, it seems that work here in Arkansas and South Missouri to enhance the reproduction of a few viable and original Ozark Chinquapins is paying off. Hidden in back woods and hollows, there are a few trees still capable of producing nuts. During our pubic hearing on the SWEPCO project, Elk Ranch native Bert Camp told about his few remaining Chinkapin trees. Almost all were killed by the Chestnut blight that began in New York in 1904 and spread to Arkansas and Missouri by 1950. The judge asked, as he was talking beyond his 3 minutes, "You are concerned about your trees, right?" I don't believe the judge understood that what Bert was describing was not just his trees, but a vast resource with the genetic potential to renew American forests. You just can't expect those closely involved in the power industry to understand the full significance of the environment in the same way that a local might understand it.. .even though we would like them to. You can learn more about the Chinquapin fom the Ozark Chinquapin Foundation. At this point, and due to the incredible incompetence of AEP/SWEPCO, the faults inherent in their application, their failure to consider Arkansas law in their analysis of economic impact, we expect to be successful in keeping the powerline from taking Bert's Chinquapins. The power company response to endangered species of plant and animal life has been, "That's not the only place to find it." And they are right. Their proposed route 109 endangers one of three places in which blind cave crayfish can be found. Bert's Chinquapin grove at Elk Ranch on route 33 is one of only a few places in North Arkansas and Southwest Missouri where Chinquapins still stand. In this world, and in this day we face an incredible greed driven thoughtlessness that would destroy every hope for achieving an ecological paradise. 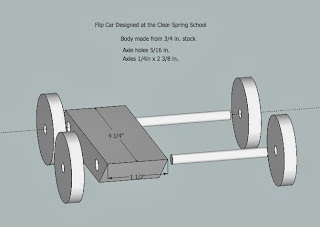 Today in the CSS wood shop, my 4th, 5th and 6th grade students will begin making drop spindles, and my high school students will have a percussion lab as we plan the making of cahones. I have been preparing for tomorrow's classes. 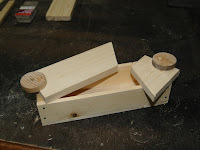 My 4th, 5th and 6th grade students will begin making drop spindles, for use in spinning wool. 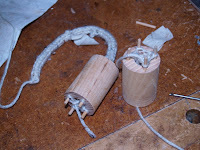 My high school students will do experimental percussion instruments as a precursor to making cajones (wooden drums). Pestalozzi told of his objective in attempting to start an elementary school at Stanz. "My aim was to carry the simplification of the means of teaching so far, that all the common people might easily be brought to teach their children, and gradually to render the schools almost superfluous for the first elements of instruction. As the mother is the first to nourish her child physically, so also by the appointment of God, she must be the first to give it spiritual nourishment; I reckon that very great evils have been engendered by sending children too early to school, and by all the artificial means of educating them away from home. The time will come, so soon as we shall have simplified instruction, when every mother will be able to teach, without the help of others, and thereby at the same time, to go on herself always learning." Today at the Unitarian Church in Eureka Springs, we had a concert by my friends Kelly and Donna of Still on the Hill. 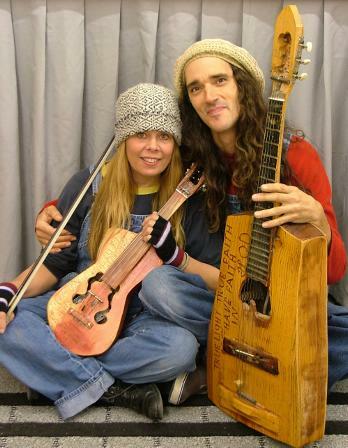 They talked about (and sang about) the Ozark Chinkapin tree and work that they are involved in with the Ozark Chinkapin Foundation to bring it back from a few remaining trees that seem to have survived the blight that killed most of them in the 1950s. We have a small grove of survivors near the town of Elk Ranch, just north of Eureka Springs, that SWEPCO will cut without qualms if given half a chance. It is a pleasure to stumble across ways in which I have been of some small influence to others. 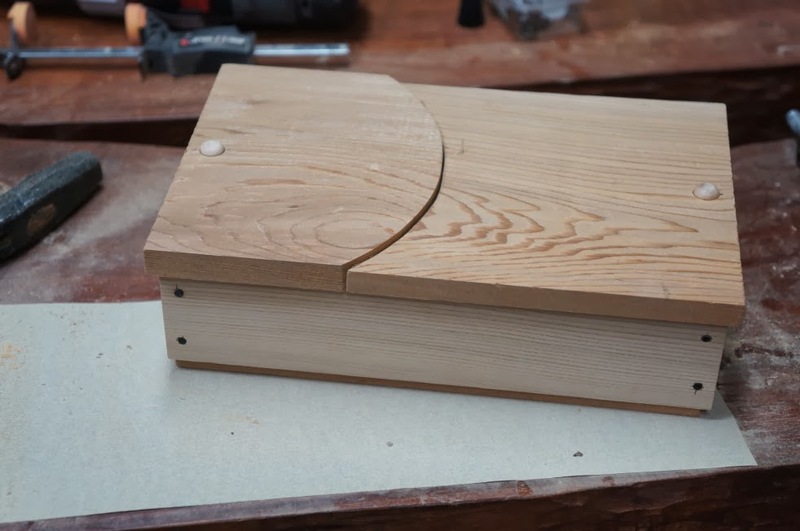 This flag box is featured on the Fine Woodworking website, and the design was graciously attributed to an article on box making that I wrote for Fine Woodworking Magazine, #201. 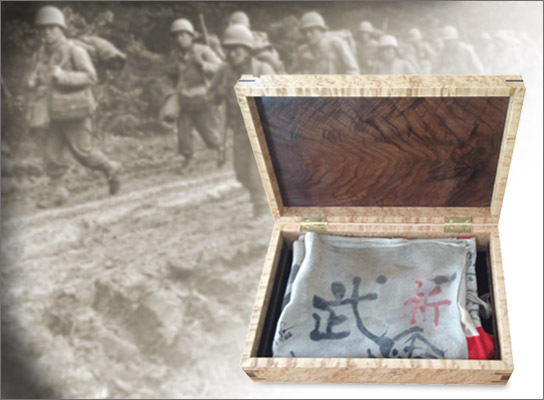 It is a beautiful box, and a great story. Today I will prepare for Monday's classes. On the SWEPCO front, I am pursuing a new angle. SWEPCO's preferred route 33 passes between the main body of Pea Ridge National Battlefield Park and a small detached area of the park in which Union troops were held waiting for deployment in battle. Route 33 passes directly through a small bottleneck between those two portions of the park. I am seeking Congressional support for adding that land to the park. If that can be accomplished, the National Parks Service would have the last word, and put AEP/SWEPCO dead in the water. 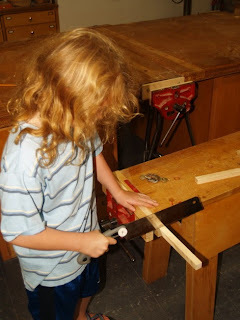 It is so easy these days to learn how to do things if you have a few basic tools and the necessary materials. The internet provides plans for just about anything you would want to make. Still, you will need skill and experience. This year at Clear Spring School our music teacher wants to focus on percussion using instruments that the kids have made themselves. At the high school level, since we made guitars last year, we will be making Cajones. A cajon is a drum like instrument that you sit on as you play and they've become popular among folk musicians. You can add various components to the inside to increase their resonance or vibration. In association with this project we are going to take the high school students to the Walton Arts Center to see an exhibit of Ed Stilley's guitars and fiddles. Stilley used various experimental resonating devices inside his instruments, as you can see in the x-ray photograph shown above. On Monday, and as we are waiting for the materials to arrive, we will conduct an experimental sound lab. It may be relatively easy to make things with all the instructions available and if you have material and the necessary tools. But where do the ideas come from? 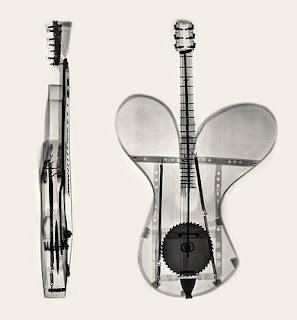 Have you ever seen or imagined a guitar made like the one above? An article in National Geographic this month explores the necessity of explorers being wrong, and without taking the risk of being wrong, how can any new thing be discovered? Schools should be more about experimentation than about learning right answers. One of the things that is less fun than making things is selling them. Selling work takes me out of the wood shop. I was alerted by friends that Crystal Bridges Museum Store was completely out of my work, so this afternoon, I drove over to make a delivery. Next I need to get boxes into the hands of local galleries, as those outlets, too, are low on my work. It feels good to thin the inventory here in my office and to get the cash flowing, but it always feels best to just hang out and be creative in my wood shop. But the things I make have to go somewhere. A house with too many boxes and too little cash is not for the best. I learned today that in addition to my new book, several of my older projects will be included in a new box making "bookazine" published by Taunton Press. It will be a compilation of projects from my book, Basic Box Making, from a book by Strother Purdy and perhaps articles republished from Fine Woodworking Magazine. This kind of book project is a nice thing for me as it will be based on work I've already completed. To keep it from competing directly with my own books, it will be available only for a limited time. Today was my first day back at the school wood shop, and it as a pleasure being back with the kids. Due to my travels and week at the SWEPCO hearing in Little Rock, a case in which I was to be called as a witness, my wood shop classes were not to begin until next week, but when I walked on campus and received so many hugs and so many questions about when woodworking would begin, I knew that I needed to get the kids' hands on wood ASAP. Our school music teacher is planning to work with the kids on percussion and had asked me if we could make some simple rhythm sticks using wood and bottle caps. Of course we could. Our pre-school/kindergarten teacher Ms. Charla, already had a box of bottle caps gathered and ready to be flattened and drilled. The project is simple. 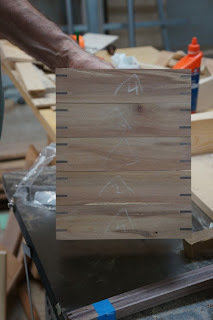 It requires a piece of white pine cut into a 3/4 in. square stick. Cut that into 3 seven inch pieces and then cut one more piece only one inch long. 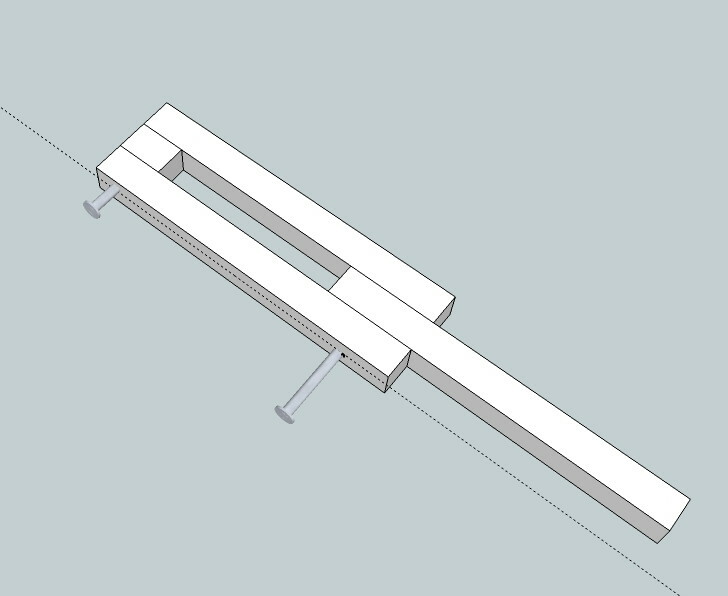 One long piece forms the handle, two pieces form the sides and the short piece forms the end. The opening houses the bottle caps. Drill pilot holes for nails and drill additional nail holes for holding the bottle caps. Flatten the bottle caps and drill a hole in each with the drill press. We use pliers to hold the bottle caps to keep them from spinning around the drill. My 7th, 8th and 9th grade students also began making rhythm sticks this afternoon. 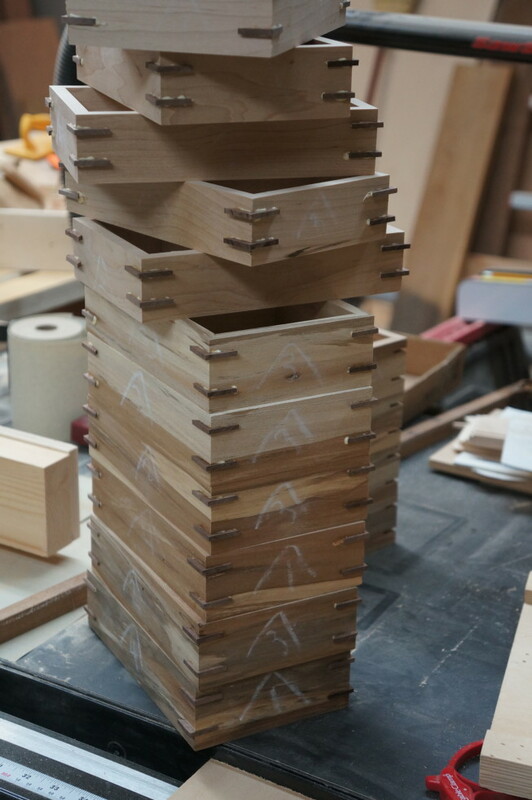 They love any project in wood shop and also decided that they want to begin collecting and trading bottle caps. I am in the process of adding keys to the miter joints for the trays that form larger boxes. These keys strengthen the corner joints, and are necessary because glue alone does not work very well on end grain. The keys spanning the joints add extra gluing surface and mechanical strength. 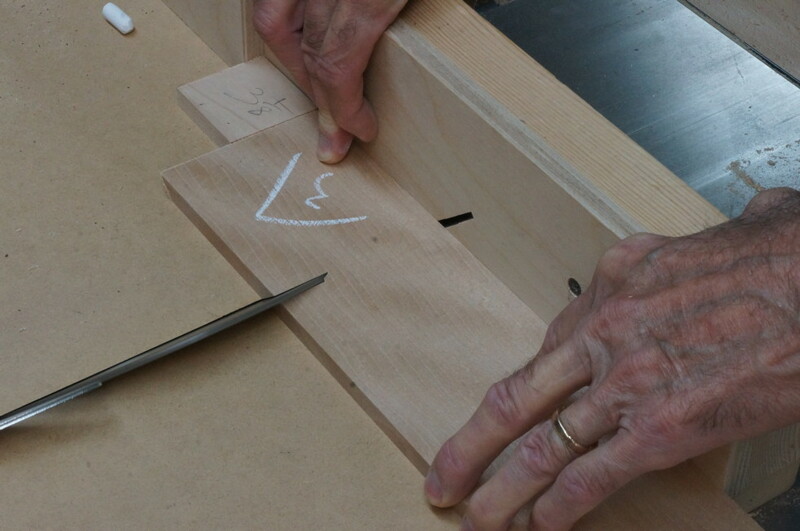 While a miter joint, simply glued might last for years, with the added keys, the joint will last for generations. During the hearing in Little Rock last week as I listened to engineers insist that the extra high voltage power line they want to foist through our community is for "reliability" and not "transmission capacity." One described the proposed power line which would offer 4 times the capacity of the lines currently in Northwest Arkansas as providing reliability "head room." That certainly makes sense. A fire hose delivers water more reliably than a garden hose. But it might be kind of hard on your petunias. Would the addition of a power line having 4 times the current capacity add "reliability head room?" Technically yes. Is 10 or 20 times the necessary headroom needed? No. And it is sad to watch engineers fudging their answers. AEP/SWEPCO engineers attempt to steer the conversation away from "transmission" because an increase of transmission capacity is the real purpose of the power line. It is intended to connect with other power lines headed north and east of here. In actual fact and according to testimony, only 17 percent of the power from the new line would be billed to folks in Arkansas, leaving 83 percent to be billed out of state. Does that provide any clarity on how this power line will resolve reliability issues? Reliable profits for AEP/SWEPCO, no doubt. 3. Engineers shall issue public statements only in an objective and truthful manner. It is truly amazing what people working for large corporation will do for money and hopes of advancement. When you are working with real tools, real materials, in the crafting of useful beauty, you cannot wander far from the truth. Lies and deceit mount up quickly, and are revealed in work that can be easily assessed. That was understood by early teachers of manual arts. It was known that working with wood would lead students to skill, intelligence and moral fiber. As you can see in the photo above. Rare earth magnets can hold the various parts of a box together. I'm supporting it from the top. One of the most interesting and dramatic moments in the Arkansas Public Service Commission hearing in Little Rock last week came on Wednesday when the APSC legal staff introduced a letter from the US Department of the Interior. The letter had arrived at the APSC on Tuesday and was buried in the comments section of the APSC website and was not brought to the attention of the STO legal staff until Wednesday. The APSC staff introduced the letter to the audience and lawyers at the same time during their cross-examination of SWEPCO witness Stephen Thornhill who had been responsible for the Environmental Impact Statement prepared by Burns and McDonnell engineering company. "....to conserve the scenery and the natural and historic objects and the wildlife therein and to provide for the enjoyment of the same in such manner and by such means as will leave them unimpaired for the enjoyment of future generations." The letter from the Department of the Interior was the second letter sent to the APSC in response to the power line proposal. Both expressed deep concern about the future of the National Battlefield Park at Pea Ridge if preferred route 33 was allowed to proceed. That power line would mar the visual impact from within the current boundaries of the park and would damage important historic battlefield properties long sought for acquisition by the National Parks Service. Efforts to create and preserve the battlefield at Pea Ridge were begun between 1887 and 1889 by veterans of both the Union and the Confederacy who sought to honor their dead. In the Battle of Pea Ridge, March 7-8, 1862, 26,000 soldiers fought and decided the fate of Missouri and the West. It has been said that the State of Missouri was kept in the Union by the Battle of Pea Ridge. ave the Ozarks attorneys argued over how and whether the letter should be admitted into evidence, SWEPCO attorney David Matthews argued vociferously that the letter was irrelevant because it would take an act of Congress for the Department of the Interior to acquire the lands sought for inclusion in the park. The park and Department of Interior, according to SWEPCO and SPP attorneys, has no authority to stop them from doing whatever they want to do. American Electric Power Corporation, parent company of their SWEPCO subsidiary, claims as one of their key corporate values, that of Citizenship, which they describe as “developing a sense of community among all those they encounter.” Would it not be a better expression of the values of citizenship and community to assist the National Parks System and the people of Northwest Arkansas in the vigorous protection of all the land associated with this historic battlefield rather than to battle before the APSC for their right to its desecration? It’s my hope that AEP/SWEPCO, the Southwest Power Pool, their management and legal staff come to a better understanding of how their proposal and their aggressive defense of it have violated their professed corporate values. I hope they see the light and pull the plug on this project. Rather than proceeding in the Shipes Road to Kings River power line plans, AEP/SWEPCO should purchase all of the missing pieces of the Pea Ridge Battlefield Park and give those as a gift to the Park Service as the first part of their apology to the people of Northwest Arkansas for this power line fiasco they have foisted upon us. In the meantime, since they likely will not, Save the Ozarks is planning to see them in court. It is so nice to be home and to have the wood shop available to me. I've taken up where I left off last week. One great thing about making things from wood. The material will remember right where you left off. 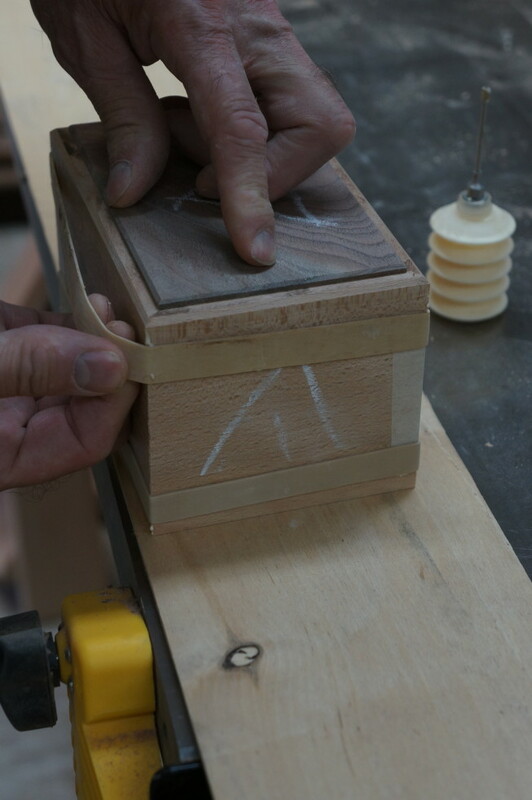 I've sanded the top and bottom edges of various parts of the box so they can nest neatly together. Then I cut the slots for the miter keys to fit. Next will come bases and lids. "I love work, I can watch it all day." In my opinion doing work beats watching, and I feel at looose ends without it. Tomorrow is labor day, as established by Congress in 1887. "Following the deaths of a number of workers at the hands of the U.S. military and U.S. Marshals during the Pullman Strike, the United States Congress unanimously voted to approve rush legislation that made Labor Day a national holiday." There is this idea that those things that are done using the physical body are mindless in some way and less deserving the respect of those having greater intellect and work with their hands stilled. But if I were to hand you a stick and a knife, or if I were to hand you a chisel and piece of lumber, and if for the first time, you were asked to engage with these tools and materials in the making of an object, you would have a tough time of it if you were to neglect to think what you were doing and what you wanted to accomplish. The following is from an earlier post, but offered in celebration of Labor Day, which Americans celebrate on the first Monday of September each year. But the matter is even worse now than what Salomon describes. So many from all sectors of society have so little sense of what it takes to create, and have not learned that craftsmanship is the foundation of human culture. As our economy fades, those who have power and those who do not have little to do but stand idly by with twiddling thumbs. I assume that if you are reading here you know better than that. I slept for an extended period yesterday as my body and mind attempted to overcome the amount of physical and emotional stress involved in sitting through a week of hearings on the Shipes Road to Kings River proposed power line fiasco. It is unbelievable to all from my small community that a corporation can be so completely out of touch, so reprehensible in their dealings with folks through out a region of such beauty as we enjoy here. I was too tired yesterday to be in the shop. My wife advised me to stay away from power tools and anything sharp. That is a good lesson to take to heart. Most accidents happen when we are under stress of some kind, tired or distracted.